Kelsey Sheppy is enthusiastic about living an active lifestyle. She balances a busy work life at RE/MAX of Western Canada head office with a busy home life, raising her two teenaged step-kids, walking her two Yorkies and running half-marathons. But there is one activity that, up until this year, has always terrified her…riding a bike. Kelsey isn’t alone in her fears. Some researchers suspect this may be one reason why women make up just 25% of regular cyclists. After an hour pouring over maps, Kelsey was able to find a safe route with a mix of bike paths and slower neighbourhood streets. But it wasn’t all smooth sailing. As it turns out, Kelsey’s route preferences are fairly typical. Dr. Kay Teschke has done some interesting research on the type of routes that will attract different people. Her findings show that separated bike paths – like the ones Kelsey prefers – are the best for attracting new and inexperienced riders, as well as experienced, confident ones. On-street bike lanes only work for experienced road warriors. However, traffic calming measures put in to divert or slow traffic on quiet neighbourhood streets bring out more people on bikes. 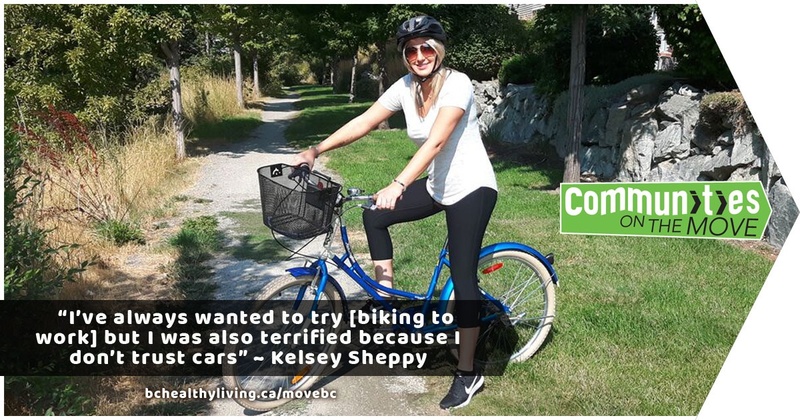 BCAHL’s Communities on the Move initiative is working with partners so that more women like Kelsey can be active, comfortable and safe riding a bike or walking where they need to go. There is plenty of good research in BC, such as Dr. Teschke’s, to help guide community planning decisions so that the bike paths we design are both motivating and safe for users. Many local governments across BC have, or want to develop, ‘active transportation’ plans, facilities and motivating educational events like Bike to Work Week, but they need the support of the provincial government. If you would like to see more safe, comfortable biking and walking routes in your community, please call or write to your MLA and tell BC’s leaders that you support Communities on the Move!